We started from Bangalore at 8:30 pm in Volvo a/c bus and reached Udupi the next day at 6:15 am. We took room nearby temple to save time. The rooms are maintained by temple authorities. It was cold Ekadasi morning and there was no hot water available for taking bath. On Ekadesi day, hot water or food will not be available in and around temple which are maintained by temple authorities. Devotees are thereby requested to take note of the above during Ekadasi day. We took bath in cold water and went to Sri Krishna temple for darshan. Devotees can view Lord Krishna through the window only. The legend has it that once there was a worshiper by name Kanakadasa who was very devoted to Lord Krishna and he was not allowed to enter into the temple. He was not dejected by this and continue to pray from outside. On seeing his devotion, Lord Krishna was pleased and turned towards Kanakadasa side where he was praying and broke the wall so that Kanakadas could see him. The window is called as KanakanaKindi. Opposite to this temple there is a Siva temple. 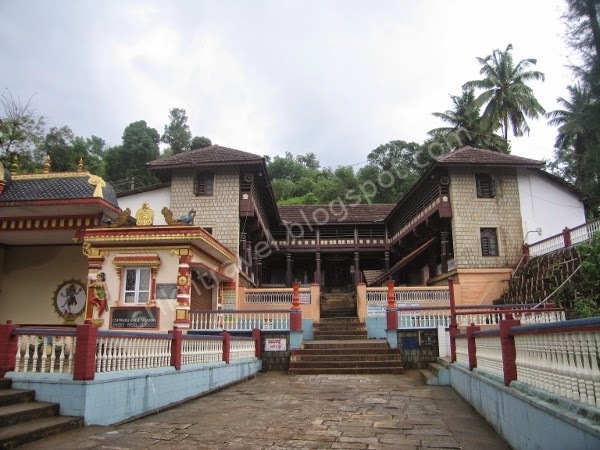 During the ancient time period, Udupi was known as Sivalli. The legend has it that the moon God Chandra did penance to Lord Shiva to get back his original form since he was cursed by Daksha Prajaapati. The meaning of the Udu is star and Pa means leader in Sanskrit. Since Chandra is the head of all the stars, Sivalli was renamed to Udupi. Shiva is known as Chandramouleeshwara since the Lord was worshipped by Chandra. We hired a car for 3 days in Udupi. We had our breakfast and proceeded towards Malpe Beach. We had to wait for more than an hour in the beach for ferry to start. To reach St. Mary Island minimum 30 members should be there to operate the boat. We had chance to see shipyard and speed boat which is used by Karnataka police from close range. For making a ship it is estimated to take an year. St. Mary Island is also known as Coconut Island. This is around 7 km from the beach. St.Mary Island is a collection of small islands (series of hexagonal basalt rock formations) in the Arabian Sea off the coast of Malpe. One can see the varieties of sea shell that lie in the coast. During monsoons boat rides are discontinued due to rough sea. People should note that there are no stalls available in the island. 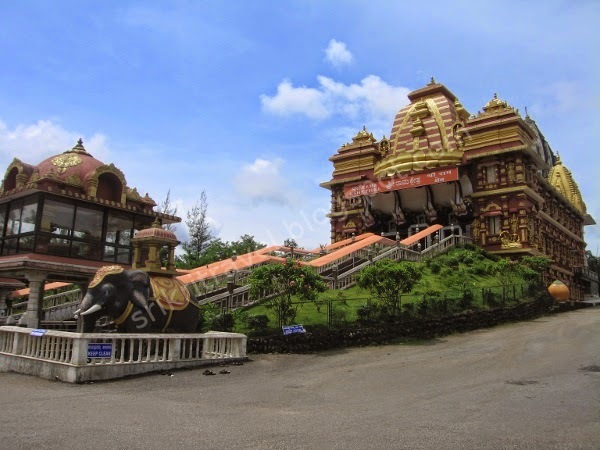 It is the temple situated at about 30 km from Udupi which is dedicated to Lord Ganesha. Ane Gudde means Elephant Hills. Here Lord Ganesha is known as Siddi Vinayaka. It is a huge statue with four arms. It is said that the two arms are for granting boons and the other two arms are for attaining salvation. The legend has it that during Pandavas period this region was hit by drought. So Sage Agasthya along with others performed the Yagna to please Lord Varuna. During Yagna the demon Kumbasura troubled the sages. Lord Ganesha presented Bheema with the sword to kill the demon. With this sword Bheema killed the demon and the yagna was completed successfully. This is one of the famous picnic spot in North Karnataka. 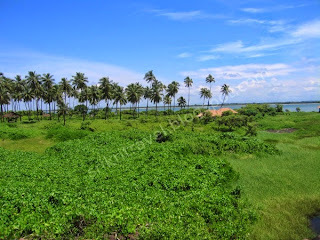 It is about 50 km North of Udupi. The Maravanthe Beach is a place where NH17 cruises along the Arabian Sea on one side and Sauparnika river on the other side with Kodachadri hills as the background. We spent some time here and moved towards Murudeswar. We reached at about 6 in the evening. It is famous for the second largest Shiva idol in the world and it is surrounded by Arabian sea on the three side. We had a darshan at the Shiva temple. Here the main deity is Sri Mridesha Linga. 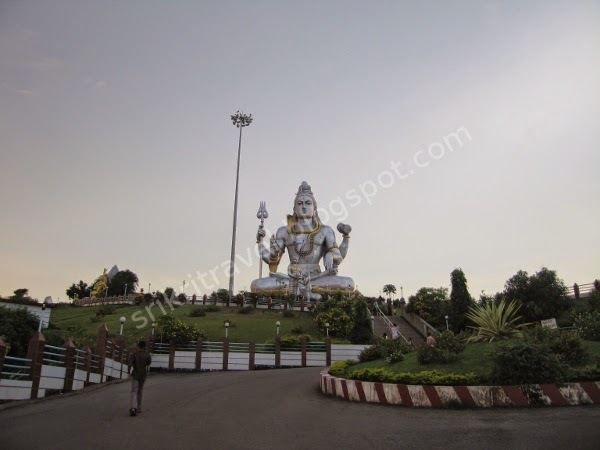 It is said that the temple is specially dedicated to Lord Shiva. There is a 14 storied Gopura. We bought the ticket and reached the top of Gopura for viewing. We saw the spectacular view of idol Shiva on one side and the coastal line on the other side. The views were mesmerizing. The legend of the story can be viewed at http://www.murudeshwar.org/history.htm. We were happy to see the world largest idol. We stand small infront of the statue both literally and philosophically. In the museum the stories are well explained in Kannada. We spent some time here and enjoyed. We reached here at about 9 in the night. The next morning we got up early to visit the temple. The main deity is Mookambikai (Goddess Parvathi) in the form of jyotirlinga incorporating both Shiva and Shakti. It is one of the seven pilgrimages created by Parasuraman situated at the river Sauparnika. Here Goddess sits in Padmasana yogic pose with four arms holding the conch and the discus. It is said that the idol was installed in Panchaloha (Five Elements) on Shree Chakra by Sri Adi Shankaracharya. 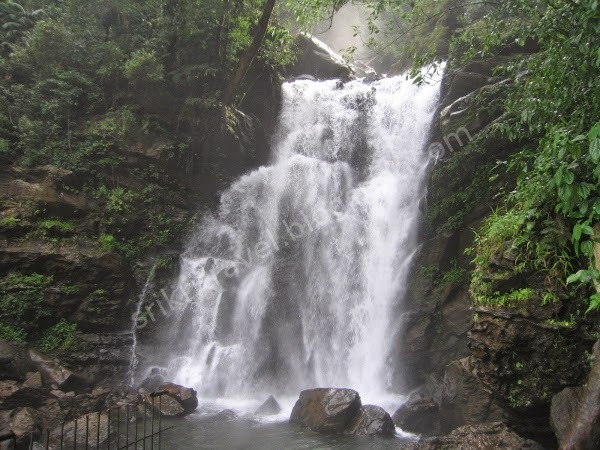 Agumbe is one of the scenic place famous for its spectacular sunset. It is also called Cherrapunji of South India. The popular television serial Malgudi Days most of the episodes was filmed here. This place is filled with greenery all round. We reached here at about 9:30 am. At the entrance of the temple we had darshan Thorana Ganapathi and then entered ancient temple Sri Sharadaambaal that is dedicated to the Goddess learning and wisdom. Performed Archana and had a holy dip in river Tunga. Then proceeded towards Jagadguru Shankaracharya's Guru Nivas and we offered him fruits. We got Holy blessings from Guruji. We were happy to see Jagadguru listening to all the people patiently and smilingly. After returning from Math we visited Vidyashankara temple. This temple has architectural beauty. There are twelve sculptured pillars from aries to pisces. As and when the Sun move from one to another the rays falls on the pillars. We enjoyed the architectural beauty and proceeded for the meal provided at the temple. We left for Horanadu. 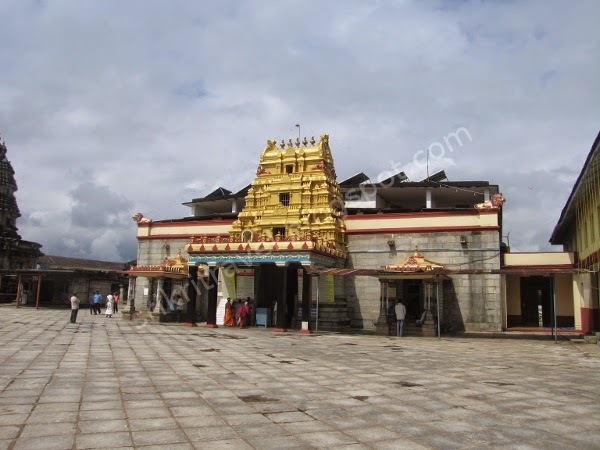 On the way to Horanadu we saw Kalaseshwara temple at Kalasa specially dedicated to Lord Shiva. The significance of this place is that Sage Agastya watched the wedding of Lord Shiva with Parvathi. The wedding took place at Varanasi. The earth position shifted since every God and Goddess want to attend this function. Sage Agasthya was sent to the South in order to restore the balance. Sage requested that he would like to witness the wedding. Lord Shiva granted him divine vision so that he could see the marriage. We reached at about 4:30 pm. After taking rest in the room, we left to Adi-Shaktyatmaka Shree Annapoorneshwari Temple at about 6 in the evening. 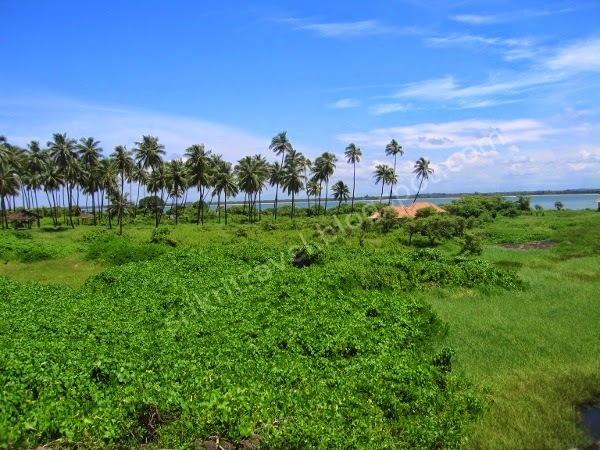 Horanadu is a place with enchanting natural scenary. Here the Goddess's serenity face gives peace of mind to all and this golden idol stands on a peeta with Devi Gayatri, Sri Chakra, Shanku and Chakra in Her four hands. The special feature of this temple that all devotees are fed with breakfast, lunch, dinner and also the place to sleep in the temple. Around 300 people can be accommodated inside the temple. There was special Kumkuma Archana at 7 pm. We had dinner in the temple and went to see Maha Mangala Arathi. All devotees were allowed to lit the lamp at the temple and Grand Mangala Arathi was performed. Next day we started at about 7:30 morning to Soothanabbi falls which is located in Kudremukh National Park. This fall is also known as Hanuman Gundi Falls. The falls is 22 meters in height We purchased the ticket and climbed down and went near the falls and spent some time. On the way to Dharmastala we stopped at Sri Rama Kshetra. 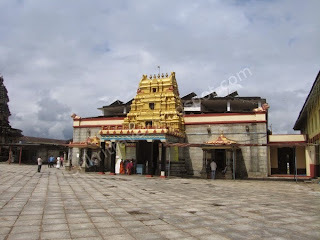 Shri Shri Shri Athmananda Saraswathi Swamiji is the founder of this magnificent temple. The main deity is Lord Rama and there are 36 different idols like SaiBaba, navagrahas, etc... Dharmastala is famous for Manjunatha Swamy situated at Nethravathi river. The main deity is Lord Shiva. After darshan we left for Kukku Subrahmanya. We reached Kukke Subramanya at about 4 in the evening. Lord Subramanya is the main deity of this temple. On the upper dias lies Lord Subramanya idol and then Vasuki idol and little lower the idol of Shesha. The legend had it that Serpent King Vasuki who is a great devotee of Lord Shiva performed Tapas for years in the Biladwara caves of Kukke Subrahmanya in order to avoid from the attack of Garuda. Lord Subramanya gave darshan to Vasuki and blessed him that he would stay in this place forever. The other deities are Hosagaliamma, Uma Maheswara, Kala Bhairava. We went to Adi Subramanya which is 250 m North of the outer wall of the temple. 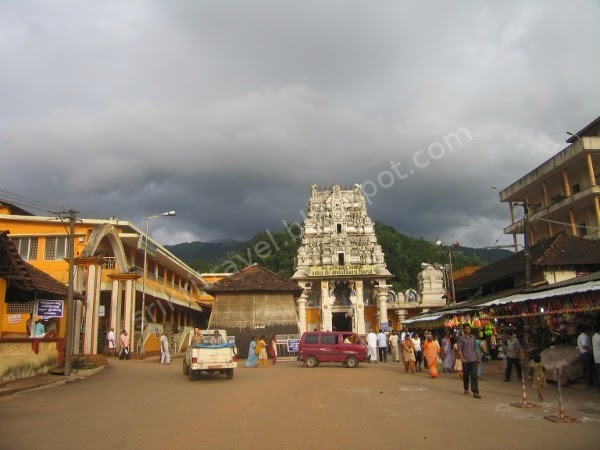 It is said that one has to visit this temple in order to get the benefit of pilgrimage. Opposite to this temple Kumaradhara river flows. After darsan we left for Bangalore the same night.